The Foggy Daze Mini Puffs have quickly become one of our best selling items! Let’s discuss why you gotta have ‘em: they’re cute, convenient, high quality and built for on-the-go good times. Don’t overlook this hidden gem on the menu. You’ll be glad to have a tin on those sunny park days or in those “I could use a quick toke” moments — and your friends will be thankful, too. The Mini Puffs are four small joints rolled with 100% A-Grade cannabis flower (we’re talkin’ the best stuff in here– no shake!) Foggy Daze offers the minis in revolving strains– they could be Dark Shadow, Power Plant, Blue Dream, etc. and we’ll let you know what we have available on the menu listing. Click on the thumbnail to learn more about the different strains, growing processes, and THC/CBD content of the cannabis used in these prerolls. Aside from knowing (and feeling) the high quality of the cannabis, the aspects we love most about the Mini Puffs are the convenience of the size and durability of the packaging. 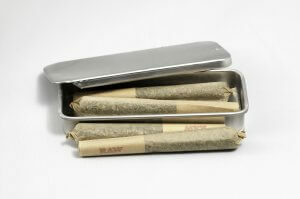 Before discovering these cute tin containers, I often found myself enjoying a day at the park or beach but wishing I had a joint for a quick toke or to share with friends. I usually don’t keep joints in my purse because they’re so delicate I worry about crushing or breaking them and then having to deal with not only a messy bag but also the waste of a preroll. However, the Mini Puffs are small enough to fit into any size bag – just toss the tin anywhere! – and you don’t have to worry about any damage. They even fit in my zippered wallet or various pants or jacket pockets. The packaging is inconspicuous and I have been able to reuse the tins for other things once I’ve finished the four prerolls (mints, gum, q-tips, jewelry, etc.). Talk about being green in more ways than one! My friends and I agree that the size of the prerolls is perfect; due to the strength of the grade-A cannabis, we are all able to share one and feel its effects and if we don’t finish it, the tin makes safekeeping easy and carefree. While I still enjoy and buy the larger sized pre-rolls, there’s a special something about the Mini Puffs that I adore. I am so happy they’re on the menu! Even though the holidays are behind us, I recommend keeping a few tins for yourself as well as gifting some — they’re perfect for birthdays, celebratory occasions or simply a friend in need! The Mini Puffs are a hit (haha, get it?) and sharing them will make you one, too!